The present church building was built by W. J. Hole, who operated a planing mill on the Arvin Industries site. 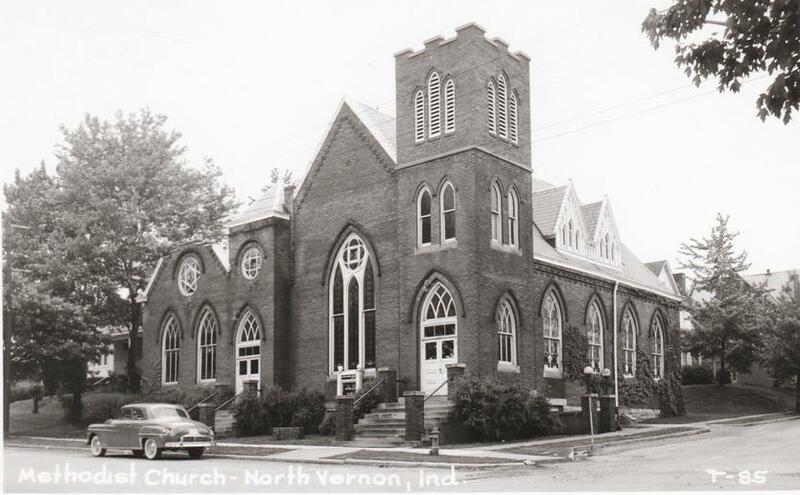 It was to be the largest of the North Vernon churches and the construction lasted two years. Several of the men who worked on it will be remembered by many of the people in the church. Eli Morris, Amos Silvers and the father and brother of Mrs. R. C. Gautier, John and Byron Wheaton. The building was basically the now, with several notable exceptions. It had no basement, it had a steeple, and the large Sunday School room had a full gable roof. The church was built with just a hole under it. The hole was just large enough to hold a few tons of coal and a furnace. There was no sewer or plan for drainage. The furnace was set on a high spot, and a deep trench was dug around it to carry off the water that hade no drain to drain out. As a result of this oversight, many services were cancelled because the basement was full of water and no fire could be built. Some services were dismissed when rain caused the water to rise, snuffing out the fire. The steeple was fifty feet high, the bell chamber was frame, with some fancy doo-dads on the corners and around the valences. The spire was hexagon, slate-covered, with a large glass ball on the tip end. It leaked rain where it joined the balfry, and was removed in 1911 or 1912. Garfield Read, Lloyd Read, and Jess Rodiman did the removing. Amos Silvers, E. O. Haymann, William Matthews, and John Grate were trustees at that time. The gable roof on the Sunday School room was, until removed, a source of annoyance. The trough formed by the junction of the two gable roofs filled with water, and since no adequate way was devised to drain off what was at some times a huge volume of water, it it was continually breaking through the pitch roof, dripping and running into the room below. In 1914, the gable roof was removed and a flat, shed type roof with built up roofing was put on. The brick work at the front of the building was left, however, and anchored back onto the roof with a heavy iron bar. When the wind vibrated the brick work, it caused the iron bar to break holes in the roof, with consequent leaks in the roof. For this reason, the high gable point on the brick was taken off, and the whole thing lowered to the level it remains today. The 1917 tornado played havoc with the church. About half the north side of the roof was blown away. The large circle window above the pulpit was blown out, and the belfry was blown around so that it teetered on the brink of falling. It was moved back into place, and later removed, and the brick belfry built. The circle window was bricked in, and the roof repaired. In February, 1917, a canvass was begun to raise $2,000, to purchase a pipe organ. The campaign was completed by March 15, with the total amount pledged. The organ was installed and dedicated the following February. The interior of the church was quite different at that time. At one time the lighting was by arc light, later it was replaced by incandescent. The main lighting fixture was a huge glass chandelier that hung from the ceiling. It was removed at one of the times the church was redecorated. A small platform, possibly ten feet square, was at the front of the church. The place where the organ and the little room now are was a recessed choir loft. It was partitioned off when the organ was installed. This little room was first used as a choir room, and the choir entered the sanctuary through the small door beside the organ console. The oak paneling was put in several years after the organ was installed. The basement was dug and the steam furnace installed in 1918. For the first time, the church had reliable heat and a kitchen in which to cook the church dinners that were then becoming popular. The large Sunday School had more adequate facilities. One Sunday in 1923, the congregation arrived for morning worship to find all the woodwork painted white. When a new minister came the next year, the enamel was all taken off, and the natural wood restained and varnished. On December 16, 1934, a re-dedication service was held after the church had been fully redecorated. At this time, the church set its face forward its one hundreth year. Untill 1950 nothing much was done to the building. At that time an oil furnace replaced the coal furnace, and the entire basement was enlarged, redecorated and rearranged. The enlargement and convenience of the rearrangement, with the modern kitchen, gives us an adequate dining and assembly room. In 1951, the sanctuary and Sunday School room were redecorated after one of the most heart warming campaigns in the church's history. With the work done on it this year, as part of the Centennial program, the building is in as good shape structurally as it can be made. The major items of the repair program are cleaning and repainting entire exterior surface, rebuilding of the organn, installation of new front doors, new storm windows in the sanctuary, repair and redecoration of men's lavatory, new metal railings for front steps, and painting and puttying of all exterior wood trim. Franklin Pierce was President, and there was an "era of good feeling throughout the land." Business was good. Slavery, the most controversial issue of the day, had apparently been settled once and for all by the Compromise of 1850. The Underground Railroad operated at capacity. It was a time of breathing before the storm. Seven states had granted married women the control of their own property. Two colleges in the country had begun to admit women on equal terms with men. Longfellow, Whittier, and Lowell were the poets of the day; Sawthorne and Harriet B. Stowe, the novelists; Emerson, the philosopher. Democracy was flexing its muscles and feeling good about it. The horse was being replaced by the locomotive. The Baltimore and Ohio had pushed its lines to Wheeling. Other railroads connected cities further west, the Chesapeake and Ohio, the Wabash, and the O. & M. Along their rails new towns were growing up. There were no great men in the country. The Clays, the Calhouns and the Websters had just passed away. Stephen Douglas had just reached the Senate from Illinois. He showed some promise of greatness. It was a time of mediocrity, of just waiting, a time of work, a time of looking westward, a time of the nation's growing, a time of awkward adolescence. Almost no one had heard of Abraham Lincoln. Those who had fought the Revolution were almost all gone. North Vernon was a lusty growing, infant town of several hundred people. One of the towns which grew because of the particular location of a railroad. A town of log cabins and muddy streets. A town of new brick buildings. Lumbering was a major industry and farming an important occupation. The town had two churches, one Catholic, and one Universalist. It was spring and the dogwood and redbud were in bloom. Methodist circuit riders from Versailles, Madison and Old Paris made their horses cross the swollen Muskatatuck to orgainze a Methodist Church in North Vernon. The place of organization was the log home of Hiram and Mary Prather, near the east end of Hoosier Street. Other than the Prather's were Mr. Prather's mother, Letitia, Mark and Maria Robinson, George W. Pennington and his wife, and Isaac Abbott and his wife. The meetings weere held at the Prather home until the summer of 1854. Mr. Marlett was class leader, and sometime during the year, E. G. Tucker became the first of forty-eight pastors. Although these pioneers worked hard to build a lasting church in the community, and Mary Prather lived until 1894, there is no record of any descendants of the group being associated with the church as late as 1920. The meeting must have grown rapidly in size, as they outgrew the Prather home by the summer of 1854, and held their services in the O. & M. depot. Dr. Klye, a local preacher, was prominent in the church at that time. The first expense for a meeting place was the $40.00 a year paid to Caleb WHitmore for use of his carpenter shop. Lateer, they worshiped in a building on Hoosier Street called Kirchner's Brick. Later they met in the room upstairs from the carpenter shop, called Wise's Hall, apparently a hall for private and public meetings. This building is still standing on 4th Street, across the alley from the Prather building, and houses, among other things, a tavern. The time of greatest expansion came during the year or so they met in the "old School House" on North State Street. This building is now a residence and is number 209. It was a time of great activity and many revivals. The Rev. Clyde McMillan furnished a poignant description of the meetings. They had no organ or choir, but they all sang following the leader somewhere around the time and the tune. They had no bell to call them to worship but the time was was announced as early candle-lighting." Because there was no lighting in the school house crude candle holders were made of two pieces of 1x4 lumber, and nailed into the window frames. When the Universalist Church offered its sanctuary as a meeting place, the services were held there until the first church was built. The Universalist Church stood on the site of the present Christian Church. It is helpful and interesting to know what the people of that time talked about. "Bleeding Kansas" became of great concern to men as the Kansas-Nebraska Act of 1854 broke the calm of the slavery issue. The new Republican Party carried fifteen states in 1854, and in 1856 at their first National Convention nominated John C. Fremont for President. John Brown and Dred Scott were both personalities and issues. In 1858, Abraham Lincoln and Stephen A. Douglas debated the issues of the day and became national figures. In 1854 North Vernon was incorporated as a city. During this early growth of the church, the meeting had looked forward to a meeting place of its own, and finally on April 6, 1861, on a lot given to the church by Hiram Prather, the cornerstone was laid. William Terrell was the presiding elder at the laying of the stone. John Fable was the contractor, E. L. Dolph was the minister, and he worked tirelessly to get the church built and paid for. Because of the hard times many members contributed work instead of money. Great and terrible things happened while the little church was "abuilding". The Civil War began six days after construction was begun, and ended a month after the building was complete. Our nation is those four years, was building, too, in a terrible way. She was deciding for all time that a nation can't live "Half slave and half free". Men from North Vernon helped decide that question at Shiloh, Vicksburg, Chickamauga, Antietam, and in the wilderness before Appamattox Court House. As a result of that effort the sons of God with the black skins became "forever free". While the little church was being built, a great man lived out the full span of his national public life, and spoke words that rank with the noblest of all time. "With malice toward none, with charity for all, with firmness in the right as God gives us to see the right, let us strive on to finish the work we are in." Other things happened too. The inventions of the previous twenty years were put to work on farms, and one man could do the work of six. Industry boomed and great fortunes were made. Workmen's wages were small, however, and the people moved west to the people moved west to the fertile plains and rich mountains. The church was completed in March 1865, and dedicated on the 19th of that month by Rev. Thomas Bowman. The Trustees were J. B. McMillan, Mark Robinson, Hiram Prather, Noah Piper, Thomas Patterson, H. Wetzel, and J. W. Elzea. The completion of the church marked a high point in the spiritual life of the church. Many revivals were held, and shouts of salvation rang through the rafters. But almost before the mortar was dry, the O. & M. Railroad had completed the Y, and built an overhead bridge almost on top of the church, so that with the constant switching of engines and the undesirableness of the location, the meeting began to look toward a new church. The cornerstone of the present building was laid on the 4th of July, 1891 by the Masonic Order, after a subscription amounting to $5, 460.50 had been taken the year before. Will Hole was the contractor, but because of the times, the building was slow, and not completed until two years later. The following farewell service was held in the old church on April 4, 1893. Five days later, on April 9, 1893, the new building was dedicated. Taking part in the serviicce were Dr. Earl Granston and G. M. Smith, the resident pastor. Rev. C. W. Tinsley of Madison spoke at the evenning service. On this day, a second subscription was taken that amoounted to $3,987.31. A later subscription amounted to $75.75, making the total pledged toward the building $9,523.56. The total cost of the buildig and lot was $9,736.89, with equipment, insurance and landscaping. The total cost was about $13,000.00. Accumulated debts, unpaid principle and interest left the church in debt $4947.68 by 1898. On September 15th of that year the entire indebtedness was liquidated. This was made possible by large gifts from Harvey Weeks a farmer and Mr. J.l B. McMillan a banker and by sacrificial giving by members of the church and friends in the community. The Rev. J. W. Johnson resigned following his terrific effort to get the church in a solvent condition. Trustees were: H. R. Weeks, James H. Green, Robert Shook, H. A. Piper, and B. W. Hobson. In 1900 the world stepped over into a new and exciting century. A century that was to bring with it the greatest technological advances of all time. A century that was to begin with waterwheels and develop them into huge hydroelectric plants, to begin with buggies and dog carts and develop into Fords and Cadillacs. A century that was to bring with it a multitude of problems in man's relationship with man. A century in which the Church could play a leading part or lesser one as it chose. There must have been fine sermons and a feeling of accomplishment among the several hundred members of the church as the twentieth century began. They had a large active membership, two services every Sunday and a large church that was paid for. They looked back and saw the progress they had made from the log cabin home of Hiram Prather. Some of them may have looked forward to the year we celebrate now. But as the world had its troubles then, so had the church. Within a year after it celebrated its golden anniversary the membership had lowered. Revival services in that year were unsuccessful; the greatest work being the gradual imporvement of the Sunday School. The average attendance a year later was 142. Benevolence giving was the highest on record that year being twice that of any previous year. The Epworth League was an active organization and at a Seymour District Convention held here in 1906, one hundred and thirty- five delegates were entertained. The League remained a strong organization in the church until the middle 30s when the attendance slipped. One of the things that comes to one's attention in the history of this church is the parallel between long pastorates and church stability and growth. H. J. Black served four years during which time the present parsonage was built. Many of the people still active in our church were married or became members at that time. The largest building alterations were made during the five year pastorate was that of Harry O. Kisneer. During this period the church recovered from the early depression duldrums and was able to redecorate and rededicate the building. The record since then is clear in the memory of almost everyone. The times of war and unceertainty, the lagging of the spirit, the faltering of purpose. However it is a different church than that which celebrates its centenial year. It is a church that gives every indication of knowing what its purpose is. Its leadership is inspired and awake to the great responsibilities we have as we step over the first century of service. We can, because of the heritage we have received, set our faces steadfastly to the future and as a mature Church proclaim the good news of God's saving Grace as that little band that first met together for our sakes would have us do. Not all were members, some were just supporters of local progress. Alley, Carrie Musser, Mrs. A. J. Alley, George McConnell, L. H.
Bascom, E. H. Moran, A.
Coryell, S. C. Naglle, L.
Conner, Mrs. A. S. O'Connor, Mrs.
Choir, M. E. Pennington, W. L.
Conkling, P. Prather, W. B.
Ellis, Horace Robinson, Mrs. J. R.
Epworth League Rash, J. M.
Erwood, R. Richards, Thos. H.
Erwood, Bessie Reynolds, Mrs. A. A.
Fisher, B. F. Reynolds, A. J.
Fleming J. W. Sutton, S. C.
Giles, Mrs. Winnie Suddith, Mrs.
Green, J. H. and wife Silver, A. C.
Hargrove, B. F. Shepherd, A. R.
Havens, Nellie Spencer, J. H.
Hand, John Shuck, W. A.
Hobson, B. W. Shook, R. H.
Hole, Joseph Smith, J. B.
Havens, Mrs. Thomas Smith, Rev. G. M.
Hallawell, Mr. Smith, Mrs. G. M.
Holmes, F. Shepherd, Mrs. N.
Horner, Mrs. E. deceased Silver, Mrs.
Johnson, A. P. Shepherd, Mrs.
Kutchback, Mrs. C. H. Shafer, J. H.
Kidd, J. D. Teepee, Wm. Kelley, Mrs. A. J. Thenis, Mrs.
Kelley, Morrison White, W. H.
Kelley, Lyman White, E. F.
Love, H. Wise, Mrs. N. A.
Ladies Industrial Society Wetzel, Mrs.
Lawrence, J. T. White, Mrs. W. W.
Long, Mrs. Mattie Walker, Mr.
Love, Mrs. Carrie Yater, J. R.
Bohnen & Son Little, F. E.
Berkshire, Mrs. J. G. Line, Mrs. C. E.
Bay, Walter Linkhart, J. W.
Bay, David Morgan, E. C.
Brolley, Thomas McMillan, J. B.
Berkshire, J. G. deceased McMillan, Mrs. J. B.
Craig, Mrs. John Monroe, A.
Cochran, J. W. More Bros.
Davis, Don O'Conner, Mrs. A. M.
Davis, J. A. Olcott, E. E.
Davis, Josie, deceased Olcott, Mrs. E. E.
Dixon, Mrs. L. Parrish, D. G.
Dickerson, Fannie Perry, Mrs. W. E.
Eastman, H. F. Peak, C. N.
Everett, Mr. Prather, Mrs. W. B.
Fable, John Prather, W. S.
Green, Dr. J. H. Sunday School, M.E. Gumble, Wolf Shepherd, A. L.
Hole, W. J. and men Stearns, W. B.
Hole, W. J. Schaffer, J. H.
Havens, Mrs. Smith, J. B.
Hillerman, W. E. Stearns, Mrs. M.
Hayman, E. O. Thompson, Mrs.
James, Annie White, W. H.
Johnson, J. B. Wise, Mrs. N. A.
Johnson, Allie Wiseman, Mrs. M. E.
Kellar, Mrs. Wilton Weatherington, A. W.
King, James Weeks, H. R.
Written when the new church was being built. This church burned and a newer church is now located at 240 W. Poplar St. The church will have a frontage of 67 feet and four inches, and in length 71 feet. It will have four rooms, and all can be thrown into one room. Will be of brick with moulded brick trimmings. Roof will be of slate. Will be heated by two furnaces. The windows are of stained cathedral glass. One of these windows will be nine feet wide and eighteen feet six inces in height. There will be two front entrances, one in auditorium and one into lecture room. This will be one of the finest churches in this part of the state. Before there was any organization proper there was a class formed that met at Father Marlett's opposite the present colored school house. The organization of Methodism at North Vernon took place in the winter of 1853, at Hiram Prather's residence. This society of Methodists consisted of the following members: Father Marlett(leader), Hiram Prather, Letitia Prather, Mark Robinson and wife, George W. Penniston and wife, Isaac Abbott and wife, and Jane Lee. Preaching was held there till the summer of 1854, whence with E.G. Tucker as pastor, they held services in the O. & M. depot. The next year they occupied the brick where Wolf Gumble now holds forth. In 1856 they worshiped in the Wise Hall, now Mrs. Brynes' grocery. In 1857 they went to the old school house on State Street, where they remained till 1862. While here they had a remarkable revival conducted by Rev. Maupin, there being over one hundred conversions. At this time North Vernon had no sidewalks. The people were wading through mud shoe-top deep. This did not cool their zeal. This revival was the greatest in the history of North Vernon-up to date 1891. In 1861 the trustees determined to build a church. Messrs Tripp, Prather and Hicks, owning most of the real estate, gave ground Universalist, Luthern, Catholic and M.E. churches. Col. Prather giving the grounds for the latter. Mesdames, McMillan, Piper and Robinson, with their shovels dug away the first dirt. The corner stone was laid April 5th, 1861, Rev. Williamson Terrell officiating. 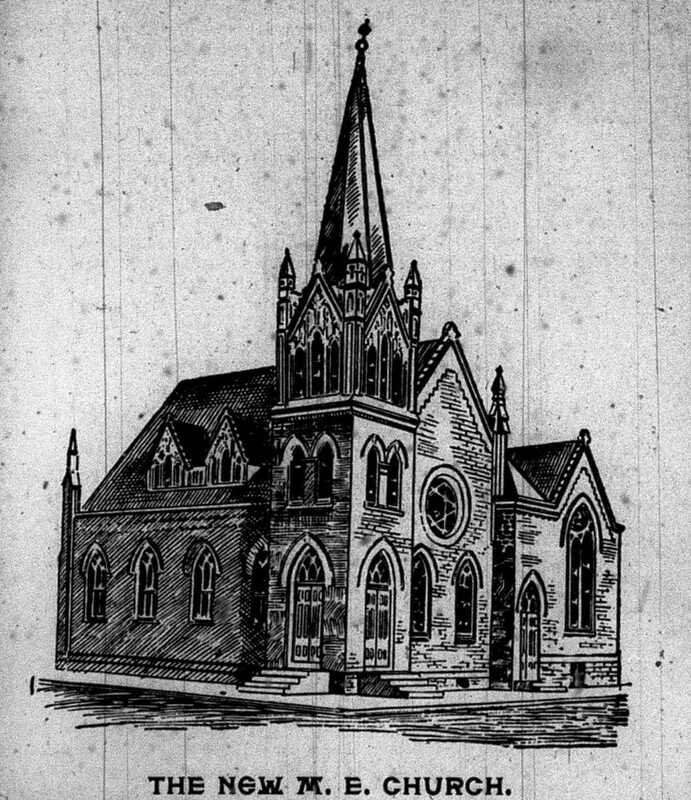 The church was completed and dedicated March 17, 1866. The dedicatory sermon was preached by President Bowman, of Asbury University. Up to the fourth Quarterly Conference of the year 1866, North Vernon and Hardenburg belonged to the Vernon circuit. Then they with Brewersville were formed into the North Vernon circuit, Rev. A.B. Hestor pastor, and S. Tincher presiding Elder. In 1870-71 the circuit was North Vernon and Hardenburg. In 1872-73 Brewersville and Centerville were added making four appointments. In 1874 North Vernon was made a Station, with James A. Sargent pastor. It was again thrown into Vernon circuit in 1877. In 1883 it was again thrown into the North Vernon circuit with Hardenburg and Brewersville. It continued a circuit until 1889, when it became a Station with Rev. C.E. Line pastor. A.B. Hester, 1866-six months; G.P. Jenkins, 1866-seven months; T.B. McClain, 1867-9; Henry Wood 1869-70; W.M. Grubbs, 1870-71; J.A. Maxwill and L.M. Reves;71-2; G.M. Barber, 1872-3; J.A. Sargent 1873-5; T.C. Crawford 1875-6; James McCaw, 1876-7; E.B. Caldwell, 1877-8; J.A. Maxwell, 1878-9; W.W. Reynolds 1879-81; J.W. Mellender 1881-83; T.W. Northcott. 1883-5; C.L. Bovard, 1885-8; C.E. Line, 1888-91. Owing to the unpleasant location of the old church among the railroads, the question of building a new church was agitated in a public meeting, and by the pastor preaching a sermon upon the subject, hence Feb. 3, 1890, at a quarterly meeting A.N. Marlatt, presiding elder, C.E. Line pastor, the following board of trustees was elected: N.A. Piper, J.B. McMillan, J.W. Cochran, H.R. Weeks, B.W. Hobson, R.H. Shook, P. Conkling, John Fable, and John Overmyer. March 5 the board organized by electing H.R. Weeks president, and J.B. McMillan secretary. In this meeting it was decided to take immediate steps to build a new chruch. A committee was appointed to look after a location. They reported March 13, and Mrs. O'Connors' lot was chosen at a price of $500. The ladies industrial society paid the first $100 on the lot. At a meeting of the Trustees, April 24, 1890, the present plan of the new church was unanimously selected. On Sunday. June 29, Rev. D.H. Moore, editor of the Western Christian Advocate, raised $4,000 for the new enterprise. This was afterward considerably increased by private solicitation. J.B. McMillan resigned as secretary and Trustee R.H. Shook was elected in his stead and Dr. J.H. Green trustee. H.R. Weeks, J.H. Green and John Fable were elected a building committee. A contract was made with W.J. Hole to make the excavation for the foundation, doing the work for the dirt, hence on October 11, 1890 the work was begun. On November 7 the contract was awarded to J.W. Hole for the construction of the new church, Mr. Price, of Philidelphia, Pa., architect. P. Conkling resigned as treasurer and Dr. J.H. Green elected in his place. In a trustee meeting June 6, 1891, it was decided to lay the cornerstone on the Fourth of July and also to invite the secret lodges to participate in the exercises, and the Masonic Lodge to lay the corner stone. At sunset on the evening of June 26, 1891, a concourse of people assembled at the old church, to remove the old cornerstone. The stone was removed, but alas! no relics were found. Henry Verbarg kindly did the work for the church.